Happy New Year, my friends! Here’s to a 2010 full of sweetness and happiness! So, how did you ring in the new year? There was a time when I’d stay out all night, but I can’t toss ’em back quite like I used to, so these days I like to keep it low-key…make a nice dinner and drink champagne cocktails at home. Part of last night’s celebration involved Dorie’s Low and Lush Chocolate Chessecake. I added my own chocolate and sour cream topping, mainly so I’d have a nice shiny surface on which to place the edible gold stars I found not long ago. Pretty cute, but I did have to go through the tiresome task of applying each one individually with tweezers. This cheesecake was made my favorite way (which is also the easiest way to lump-free batter, if you ask me)– in the food processor. It baked up creamy and smooth and pretty, but I have to say that I prefer the bright freshness of fruit, rather than chocolate, with my cheesecake. For that reason, I probably wouldn’t make this one again just for us, but if I had a guest coming over that simply adored chocolate cheesecake, I certainly wouldn’t hesitate. For the recipe, see Baking: From My Home to Yours by Dorie Greenspan or read Tea and Scones, as it was the Tea Lady’s choice for TWD this week. Don’t forget to check out the TWD Blogroll! 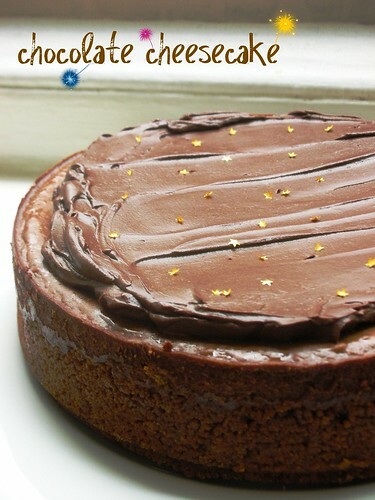 Cheesecake is probably my favorite dessert but I’ve rarely had chocolate and have only made it once. This looks so delicious! Happy New Year! Your cake looks very pretty, but I agree about the taste. It was good, but I think I’m a fruit/cheesecake kinda gal, too. I’d say it’s the perfect dessert to ring in the new year! Looks fantastic – especially with the stars, so fitting! I bet the topping gave it just the right amount of extra chocolate – happy new year! I felt exactly the same way and pretty much said the same thing, LOL. Yours sure does look lovely. Your cake looks delicious and the gold stars are so cute! I’ve never seen that type of edible sprinkes before! Ciao ! Lovely done ! I love the stars ! Happy new year ! Glad to know about the gold stars. They look SO COOL!! I also like the way you did the fudge sauce on top in a thick layers. Now that I see yours I now know what was wrong with mine. Just not thick enough! Where did you find those edible gold stars? I must have them! The cheesecake is gorgeous! I bought them at A Cook’s Companion on Atlantic Ave in Brooklyn. Beautiful photo and I love the stars! I usually like chocolate cheesecake, but this was just okay as far as the hubby and I were concerned. Sorry I missed stopping by last week. Don’t know how THAT happened. Your cheesecake is beautiful. Thanks for baking with me. I have mixed feelings about chocolate cheesecakes too…I like them, but sometimes they’re a bit much. I’d try this one, though. Those gold stars are super cool! Where’d you find those?? PS: The cheesecake….. wow! I’m totally drooling!